I’ll cut to the chase. Lex is eating again. It started a couple days ago when she snuck into Charlie’s bowl of puppy chow, and she ate the whole thing. Then yesterday morning, she ate seven slices of deli turkey, and a half can of holistic wet chunky food with gravy. Actually, it was covered with beef gravy made by Iams. She needed a little encouragement to finish the wet food, but she did an admirable job for a dog who has not voluntarily ate a thing in the last two weeks. Then last night we struck oil. Matt and I had a flank steak for dinner, and on a whim decided to pour the steak juice on her senior dry kibble. 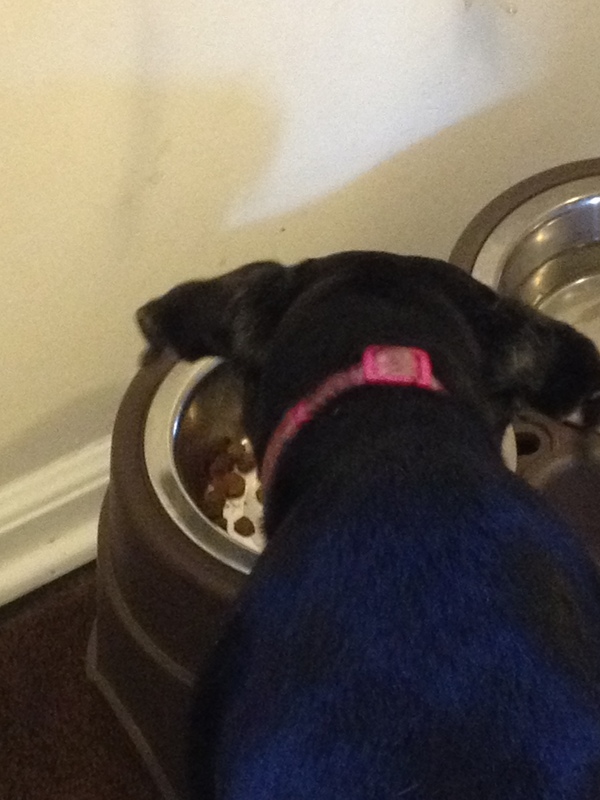 Not only did she eat the entire bowl without prodding, but she came back to lick the bowl clean. We’re not veterinarians. But we are armchair detectives. And this is what we’ve been able to piece together. A few weeks ago a new veterinarian told us to switch Lex to wet food. At first it was to help Lex gain weight (she had lost a quarter of her weight in the last year), then it had more to do with her kidney disease. Either way, we followed orders. Lex was not as excited as we imagined she would be. It’s funny how we humans assume that all dogs can’t wait to eat the mushy stuff. We’re starting to realize that may not have been the case with Lex. She fell in and out of love with several brands of wet food. We desperately hand-fed her. Then Lex flat out went on a hunger strike. I sobbed, convinced Lex would collapse within days. I started writing her eulogy. But even in my despair, I started to notice some things didn’t make sense. I knew something was up when after days of not eating the wet stuff, Lex eagerly ate lunch meat from our fingers. And she loved biscuits slathered in peanut butter. This was not a dog that had lost an interest in food. Could it be she simply didn’t dig the wet mushy stuff? The truth is, time will tell. In fact, I wouldn’t be surprised if Lex reinstates her hunger strike. I’ve hesitated on posting this blog three times in fear of jinxing our good luck. And I’m not ruling out hand-feeding my pup again. I certainly hope I’m wrong. But I’m keeping the bottle of doggy gravy handy, just in case. This entry was posted in Health, Woof! and tagged aging, dog, health, hunger, Iams, pets, puppy by ourfureverfamily. Bookmark the permalink. I hope she keeps it up. I hope she continues to eat. Thanks Clowie. 🙂 I hope for this, as well. I know her appetite is fickle, but I’m crossing my fingers that she continues to eat. Hi. I came to your blog because of your tweet to @Iams — I run the account. I’ve read your posts about Lexie and I wanted to write something that will lift up your spirits, but I have no words. I’ve been where you are. I can tell from your blog that she’s well loved, and that she knows she’s well loved. OK, maybe there is one thing I can offer (but I think you’re already doing it): Treasure the moments. When I learned that my heart dog Bailey had cancer, that’s what I did. I’m adding you guys to my prayers, and keeping fingers and paws crossed that she continues to eat.